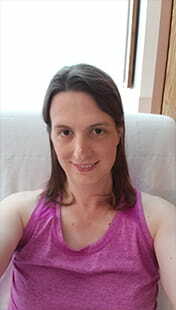 My name is Danielle, and I am a trans woman whose life-long journey has brought me to Denver Health. This is my story. Looking back, I think I always knew it. I had my friends, but I never felt like I fit in with the boys. My sister’s friends and what they did were always more interesting to me. When I was older, I found outlets in tabletop and computer role-playing games that let me play as a woman. It felt so much more comfortable, but at the time I had no idea why. I didn’t even know the word “transgender” until my early 30's. It wasn’t that I was sheltered. My life experiences just never crossed those paths. Even when I finally understood these feelings and could put a name to them, it was easier to push those feelings down and to give in to denial. I told myself I couldn’t do it. Of course, the price you pay for doing that is spiraling depression. I isolated myself from family, friends and people in general – only doing the bare socially minimal required of me. Had I continued down that path, I have no doubt it would have led to suicide. Then, in March 2017, like so many other transgender people I have met – it happened. Feeling like a horse at the race track with the starting bell going off, I awoke one morning, and it was impossible to ignore. It was time I had to come out to myself that I am a trans woman. It was time to finally come out as who I truly am. That awakening saved my life. Danielle Royall just before her gender confirmation surgery at Denver Health. I could have lost everything. I had read the experiences of other trans people who came out and lost friends, family, jobs or their homes. But I didn’t, and I count myself so blessed because of it. I came out to family and friends whose reactions astonished me. None seem surprised at me being transgender. They were more surprised that I had decided to come out. I had been working at a food service warehouse for 16 years and had been a supervisor there for many of those years. Because I was no longer going to live a false life, I did the hardest thing I had ever done there – I stood up in front of my crew and announced to them that I was transgender and to say hello to Danielle. I was met with congratulations and love not only from my team but from the management and ownership of the company. They told me that they would support me as they always have and in any way I needed through my transition. It was during this time of coming out that I found Denver Health while looking for a provider for Hormone Replacement Therapy, or HRT. I looked at many providers, but Denver Health stood out to me. Mostly, I trusted my gut, but the way they showed their mission for their LGBT Health Services really resonated with what I needed. Denver Health’s LGBT patient navigator Mafalda Dos Santos took the time to find out everything I needed to help with my transition. She connected me with Dr. Jessica Bull who started my HRT and eventually became my primary care doctor. Dos Santos, Dr. Bull and all the staff treated me with dignity, respect and sensitivity – at Denver Health, I feel like the most important woman in the world. I eventually learned of Denver Health’s plan to start a program for gender confirmation surgeries. I had many discussions about having the surgery done with my therapist. I immediately added myself to the list of those interested in having it. After so long, I had grown very happy being myself and becoming outwardly the woman I always was, but the gender dysphoria (having a gender that didn’t match what I was feeling) was also growing harder to deal with. During this time of waiting, more amazing changes happened in my life. I met and later married my wife, Samantha, who is also a trans woman. Though she is more than happy not needing the surgery, her support helping me physically and mentally prepare for it has always left me without words. Danielle Royall (on the right) with her wife, Samantha. Finally, in July of 2018, all the pieces finally came together. I got the call that I could be scheduled for surgery in October 2018. I was floored and beyond overjoyed with excitement. It was less than two years since I was publicly out to anyone, and here I was getting my turn at gender confirmation surgery. I would even be having the surgery only a few miles away from where I lived instead of travelling a great distance as many transgender people often do. My gender confirmation surgery was the first surgery in my life. It is a wonderful thing to have such a positive, life-affirming surgery as the first. My surgery date, October 29, 2018, came very quickly. The positivity of the staff from the moment we walked in was so welcoming. I never once felt nervous due to the comfort of the staff in pre-op. I was the happiest I had ever been. That happiness never stopped. Though sleepy, waking up in post-op recovery, I was still happy, and even happier to see Samantha waiting there for me when I woke up. Words will never be enough to thank my surgeon, Dr. Chris Carey, and his staff. I credit him with not having any post-op pain at all! My recovery nurse, Josh, was so wonderful and attentive to my needs, and I really thank him. I ended up on floor 4B, where I reunited with my loving family and friends, and with a nursing staff that was beyond welcoming, loving and caring. I was there for four days, and the attention to my every need and to my recovery made them family to me. Casie, Roz, Tessa, Tim, Linda, Sarahi and Alexus were my family those four days and beyond. They saw me out of surgery, helped me recover and helped me stand and walk again. It was heartbreaking to leave on my discharge day. I don’t cry often, but I did that day. My recovery couldn’t have gone any better. My health and my well-being, physically and mentally, were always the priority of those who cared for me at Denver Health. My post-op care with Dr. Carey, Dr. Jennifer Hyer and the rest of the staff in the Women’s Care Clinic is the best I could ever have hoped for. Danielle Royall gives the "thumbs up" after her gender confirmation surgery at Denver Health. Denver Health’s gender confirmation surgery didn’t make me more of a woman, but it did make me more comfortable in my own skin. I wish all people, transgender and cisgender alike, could have positive life-affirming advocates in their health care like I do at Denver Health. In a world filled with constant negativity, organizations like Denver Health and the people who work there make me quite an optimist about our future. Interested in gender confirmation surgery? Start your journey by contacting one of our patient navigators at 303-487-5474.